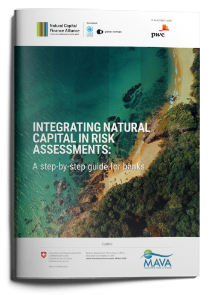 The report, ‘Integrating Natural Capital in Risk Assessments’ is a step-by-step guide to help financial institutions conduct a rapid natural capital risk assessment. The guide has already been piloted by five banks, and complements the recently launched ENCORE tool (Exploring Natural Capital Opportunities, Risks and Exposure), which enables financial institutions to understand and assess their exposure to natural capital risks. The guide helps banks to better understand how environmental change such as ocean pollution or deforestation may affect their portfolios. Sector/Asset Analysis, which uses location-specific environmental data to assess the likelihood and likely impact of disruption that businesses in their portfolios face due to environmental change. This could notably help financial institutions in their climate scenario analyses as recommended by the TCFD. Produced by the Natural Capital Finance Alliance (NCFA) in collaboration with PwC, the guide is the second phase of the Advancing Environmental Risk Management (AERM) project. Download the report here. The report from the first phase can be found here. Find out more about the launch of the ENCORE tool here.